The second book of seven in the Harry Potter series, Harry Potter and the Chamber of Secrets tells of twelve year-old Harry Potter's second year at Hogwarts School of Witchcraft and Wizardry. Author JK Rowling began writing Chamber of Secrets before her first book, Harry Potter and the Sorcerer's Stone, gained widespread popularity. In fact, she started writing the second book the very same afternoon that she finished the first. Rowling admitted in several interviews that the only time she suffered from a bout of writer's block was while writing Chamber of Secrets. She said, "I've only suffered writer's block badly once, and that was during the writing of Chamber of Secrets. I had my first burst of publicity about the first book and it paralysed me. I was scared the second book wouldn't measure up, but I got through it!" She later talked more on the subject, saying, "Chamber of Secrets, I really did have writer's block. Briefly, I think. It wasn't a very serious case, it was only about five weeks. And compared to some people, what's five weeks?" Rowling completed the second book in late June of 1997, at which point she mailed it off to her editors. Thus began the many months long editing process. As Sorcerer's Stone was not even published for a certain period of time whilst Rowling was writing Chamber of Secrets, she still often wrote in cafes. In a 1997 interview with The Independent, she is quoted as saying, "The other day in Edinburgh I went to my favourite cafe to reread the edited version of the second Harry book. Jessie was in nursery, because now I have the money to pay for her to go to one that she likes. I had a sticky bun and a cup of hot chocolate and I had this moment of divine revelation. I thought I am the luckiest person in the world. I am now being paid to do what I have been doing my whole life for nothing. I can sit here and know that this book is actually going to be published. Then I suddenly realised: I am a writer. I'm being being paid for it now. This is not my secret shameful habit that I don't tell anyone about any longer." The book was released in the UK on July 2, 1998. Bloomsbury then published a paperback version of the book in February of 1999. Just as with the first book, it was not released in the United States for around a year after its UK release; in this case, exactly a year after - June 2, 1999. The large print edition was then published in the US on February 1, 2000, followed by the release of the paperback version on August 15, 2000. It immediately shot to the top of bestseller lists, outselling the likes of Jeffrey Archer, John Grisham, Terry Pratchett, and Delia Smith, popular authors of the day. Rowling toured England and Scotland after the book was released, signing copies and reading in bookstores and schools. In a diary-style article for The Sunday Times, Jo wrote, "I've just come back from a series of public signings and readings in bookshops and schools in England and Scotland to launch the second Harry Potter book, Harry Potter and the Chamber of Secrets, and it's been one of the best weeks of my life. I've met 10-year-olds who have turned up with their own stories to show me, girls who have passed me fan letters, purple with embarrassment, boys who have stared at the floor while their mothers poke them in the small of the back, urging them to tell me how much they liked the book ('He couldn't put it down, could you, Daniel? You've read it six times, haven't you Daniel? Haven't you Daniel? Say something, Daniel.')" Jo also noted, "I lost count of the number of children who told me they had sent away to British bookshops and buying the book on the internet to get the sequel to Harry Potter and the Sorcerer's Stone. They said they could not wait until it came out in America in a year's time." Scholastic was horrified by these lost sales, which they estimated at 20,000 copies, causing them to release the book in the United States three months earlier than originally planned. By July of 1999, more than 700,000 copies of the book were in print. That number had risen to 1.8 million by September. 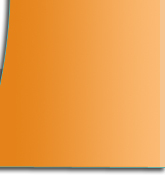 The current number of copies in print is difficult to estimate, but it is well into the millions. While home with the Dursleys for the summer, Harry is visited by Dobby, a house-elf, who warns him he will be in mortal danger if he returns to Hogwarts. Harry is determined to return despite Dobby's dire warning. Dobby, seeing that he will have to use force, decides to drop a pudding on Mrs. Mason's head. Harry is blamed by the Ministry of Magic for Dobby's charm, and is told that if he does Magic outside of school again, he will be expelled. The Dursleys, upon learning that he cannot do magic outside of school, have locked away Harry�s books and wand; Mr. Dursley has screwed on bars to his window, making him a prisoner. 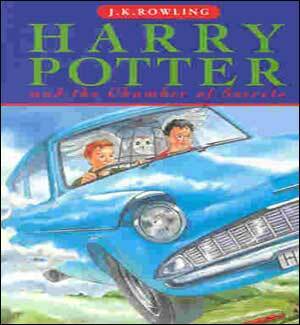 Fred, George, and Ron Weasley come to his rescue in their dad's flying car. After a pleasant summer together, everyone heads to Platform 9� to take the Hogwarts Express back to school, however, Harry and Ron are unable to enter through the magical barrier between platforms 9 and 10. In desperation, they fly to Hogwarts in the car, crashing into the Whomping Willow and damaging Ron's wand. The semi-sentient car ejects them and their belongings and disappears into the Forbidden Forest. Harry soon finds he is the unwanted center of attention of three people: the vain new Defence Against the Dark Arts Professor Gilderoy Lockhart, a wizard perpetuating his own legend; admirer Colin Creevey, a young first year Gryffindor who endlessly takes Harry's photo; and Ron's sister, Ginny Weasley, who has a crush on Harry. Events take a bad turn when the Chamber of Secrets is opened and a monster stalks the castle, which literally petrifies several students. According to legend, the Chamber was built by Salazar Slytherin and can only be opened by his heir to purge Hogwarts of students who are not pure-blood wizards. Many suspect Harry is the heir, especially after he inadvertently speaks Parseltongue (the language of snakes), a rare ability Harry gained after Voldemort's murderous attack when Harry was an infant. Harry, Ron, and Hermione attempt to discover the Heir of Slytherin's true identity. Using Polyjuice Potion brewed by Hermione, they disguise themselves as Slytherin students, Crabbe and Goyle, hoping to learn from Draco Malfoy the identity of the heir. Malfoy, they learn, does not know the Heir of Slytherin, but he inadvertantly provides Harry and Ron with an important clue. Unfortunately, Hermione mistakenly adds cat hair instead of human to her potion and assumes a feline appearance, and it takes a little more than a month to restore her normal human appearance. The attacks increase throughout the year, petrifying students, including Hermione. Most horribly, a message written on a wall declares that a student�Ginny Weasley�has been taken into the Chamber where, "her bones will lie forever." With Ron and Moaning Myrtle's help, Harry discovers the entrance to the Chamber of Secrets. They force Gilderoy Lockhart , a fraud who wipes clean other wizards' memories and claims their achievements, to go with them. Lockhart attempts to use Ron's broken wand to erase Harry and Ron's memories, but backfires onto himself and brings the ceiling caving in, separating Harry from Ron and Lockhart. 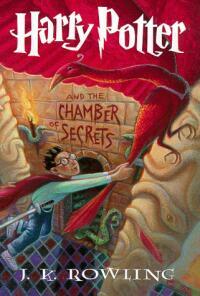 Harry makes it to the Chamber where he finds an unconscious Ginny. He also meets a young man named Tom Riddle, who claims to be a "memory." Harry learns that Ginny, under the control of Lord Voldemort, opened the Chamber. Voldemort, whose real name is Tom Riddle, imprinted his memory in an enchanted diary, to one day continue the work he begun when he reopened the Chamber fifty years ago�ridding Hogwarts of non-pureblood wizards. It was Hagrid, a Hogwarts student at the time, who was blamed for the attacks and expelled. Tom Riddle's memory grows more powerful as it steals life from Ginny's body. It tries to kill Harry by setting loose the Basilisk (the monster responsible for petrifying the students), but Dumbledore's phoenix, Fawkes arrives carrying the Sorting Hat, from which Harry draws out the sword of Godric Gryffindor. Fawkes blinds the basilisk, destroying its fatal gaze, and Harry slays it with the sword. He stabs the diary with one of the basilisk's fangs, and Riddle's memory is vanquished while Ginny revives from a near-death state. She fully recovers, as do the petrified students. Harry realizes it was Lucius Malfoy who slipped the diary into Ginny's cauldron when he encountered the Weasleys in a Diagon Alley bookshop, but he is unable to prove it. Dobby reveals he is the Malfoys' servant, and knowing their treachery, had been trying to protect Harry all year. In gratitude, Harry hides a sock in the dead diary and hands it to Lucius. He gives the diary to Dobby and Harry tells him to open it revealing the sock; it constitutes a gift of clothing�the traditional manner a master frees a house-elf from servitude. The freed Dobby is eternally grateful to Harry and even protects him from an attempted reprisal from Lucius. Dumbledore later dispels Harry's fears that he is of a kin of Slytherin's rather than to Gryffindor's nobility. He tells Harry that it is his choices that define him, and he could not have wielded the sword of Gryffindor if he did not truly belong to that house.